Barbaro’s birthdate, April 29, 2003 at Springmint Farm near Nicholasville, Kentucky and his death at New Bolton Center in Kennett Square, Pennsylvania, January 29, 2007 are already part of myth. 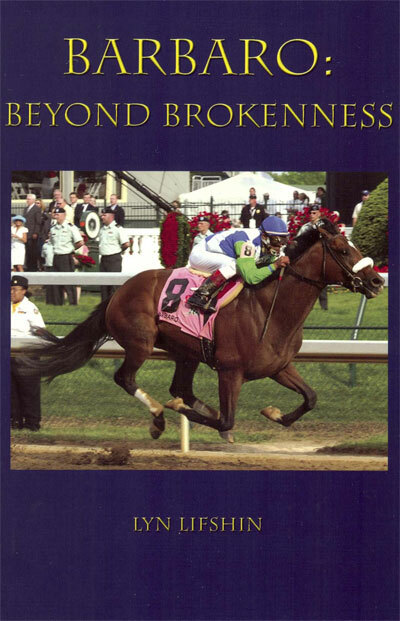 The sixth undefeated horse to win the Kentucky Derby’s Run for the Roses, Barbaro crossed the wire with a convincing 6 ½ length win, the 5th largest win in racing history. During the gallop-out after the wire, Barbaro’s lead extended to 20 lengths, rare during post-race gallop-outs. A superb athlete, Barbaro’s courage and personality after his tragic breakdown at the Preakness, moments after he broke through the gate and was re-loaded, his courage and intelligence in the following months in the intensive care hospital, the roller coaster ride we took with him and with his connections will always braid him to us.